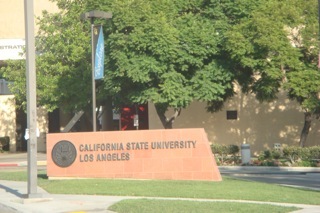 Thanks to everyone who joined us today at CSULA! 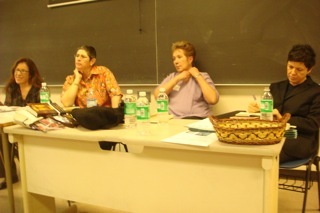 It was standing and sitting room only at our "The Historical Novel" panel. Profesoras y escritoras Graciela Limón, Alicia Gaspar de Alba, Emma Pérez, y yo were greeted by such generous and important questions after we read from our books and discussed why the historical novel genre is especially prescient for our twenty-first century. 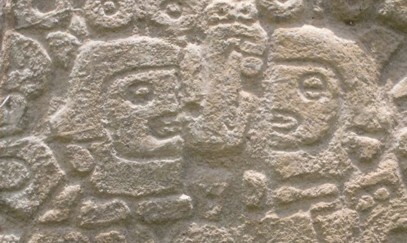 What we are all doing is returning la mujer to history--giving her voice. So important. After our panel, I also met many young Chicanas y Chicanos who are also dedicated to the "word" and I am posting their pictures here and will explain their projects (below). These young students, especially, were such a pleasure to meet because I see in them passion and commitment to the "word." They see that in the reading and writing of literature, they are participating in deepening their understanding of their humanity, of our culture. By writing, they are creating art and contributing to the transformation of their world. YOU are the future! Authors/students Rae Obnimaga, Edward Solis, Ana Bertha Hernandez, and Edward's twin are showing us their anthology, _Behind Every Beautiful Eye: A Bilingual Anthology of Poetry and Prose_. To get your copy, just click on the title here and it will take you to the website. Who are these vibrant, young writers pictured above? In their book _Behind Every Beautiful Eye_, the section entitled "About the Authors," reads: "We wrote this book when we were freshman at the Los Angeles School of Global Studies (LASGS). We are a diverse group of students coming from the United States, Mexico, the Philippines, El Salvador, Honduras, Guatemala, Nicaragua, Jamaica. 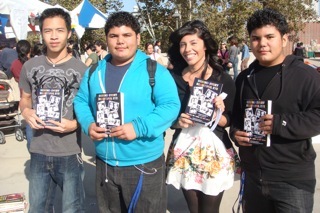 We all have one thing in common--we know what it's like to grow up as teenagers in the neighborhoods of downtown Los Angeles" (357). 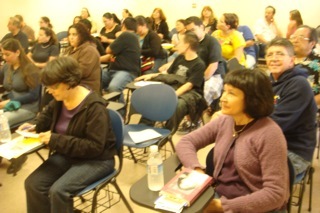 This is a project that can happen in any city because Latinas y Latinos are in every state of the U.S.
"Barrio Writers." 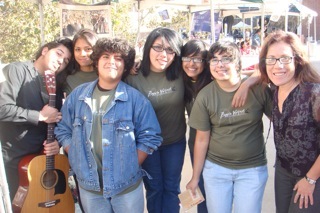 They are the first "Barrio Writers" chapter in Santa Ana, Califas--a non-profit reading and writing program that aims to empower teens through creative writing, higher education and cultural arts. This winter, their first anthology publication (entitled _Barrio Writers_) will be out. Order a copy now at Barrio Writers BLOG!! I send a special gracias to Claudia Breña (standing next to me in the picture) who took time to talk to me about being a "Barrio Writer." 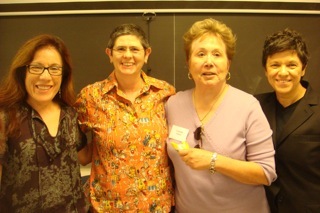 Much success to Claudia and all the Barrio Writers! A special shout out to Chicana Detective novelist, Lucha Corpi! She read from her story, "Hollow Point at the Synapses" just recently published in the anthology, Hit List: The Best of Latino Mystery (edited by Sarah Cortez and Liz Martínez). Lucha also discussed the importance of writing the mystery and detective novel. Gracias Lucha! 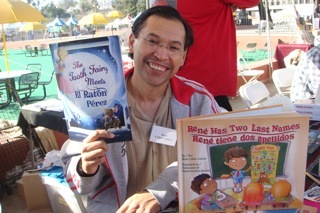 Felicidades to René Colato Lainez (above) fellow Macondista and children's author at the Latino Book Festival author booth today. He has two new books coming out: René Has Two Last Names (out October 31!) and The Tooth Fairy Meets El Ratón Pérez. 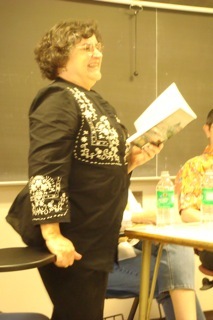 I have seen René read from the El Ratón story--priceless! Bilingual books ROCK. Gracias René! 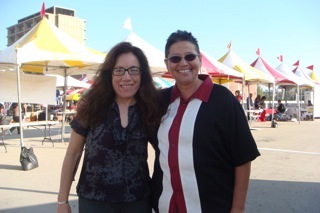 And finally--a big GRACIAS to mi carnala, Pat Alderete, Chicana author, who joined us for the day, took pictures, engaged me (as she always does) in important discussions about literature, writing, Chicanisma, barrio life, and the art scene in Chicana Los Angeles! Orale Pata. Gracias por tu presencia en mi vida! Abrazos!